The European Southern Observatory has signed an agreement to license its cutting-edge laser technology to two commercial partners, Toptica Photonics and MPB Communications. This marks the first time that ESO has transferred patented technology and know-how to the private sector, offering significant opportunities both for business and for ESO. The two agreements will serve as test-cases for a new strategy for ESO’s Technology Transfer activities. ESO Raman fibre amplifier technology  was developed in-house for use in sodium laser guide stars. These form part of the adaptive optics systems that make ESO’s Very Large Telescope one of the world’s premier astronomical observatories. Since the technology also has wide potential beyond its use in adaptive optics, ESO has chosen to disseminate the technology by offering non-exclusive licensing deals to potentially interested commercial users. Technology transfer encourages the widespread use of ESO’s know-how, meaning that business benefits from a regulated access to novel know-how and from licensing the new technology to increase the industry competitiveness and product spectrum. ESO benefits from the adoption of its proprietary technology as an industry standard ensuring its long-term availability, and pursuing one of its missions, technology transfer. The non-exclusive licensing means more choice of suppliers in future for ESO and enhanced relationships and closeness with industry. 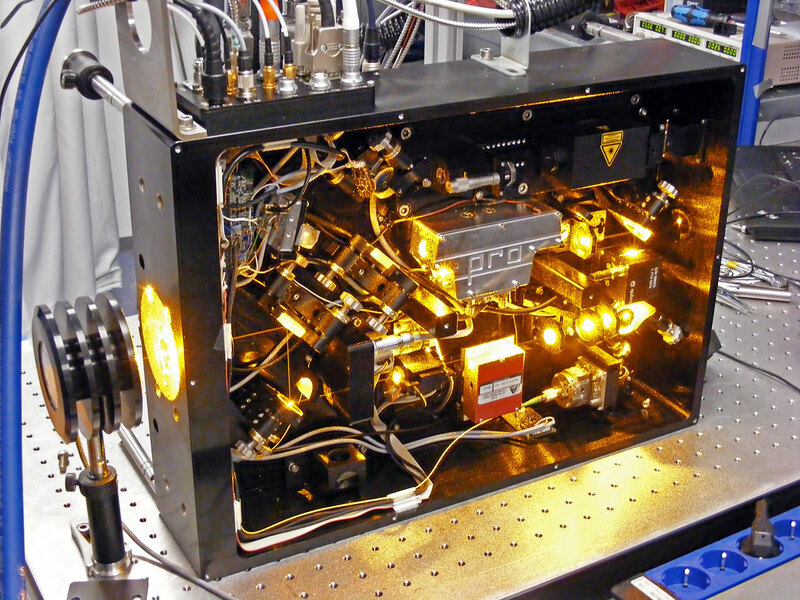 Compared to lasers built with other technologies, ESO Raman fibre amplifier lasers represent a breakthrough in weight, ruggedness, turn-key performance, size and reliability. The advantages of ESO Raman fibre amplifier lasers make them an attractive replacement for competing technologies in many areas. They are also highly adaptable and can be used to produce light at wavelengths that other lasers cannot currently produce. This opens up the possibility of many new applications being developed to take advantage of these brand new capabilities. The novel narrowband Raman fibre amplification technique amplifies the output of a narrowband laser diode at 1178 nm up to 40 W (CW), which is then converted to visible light at 589 nm by a resonantly-enhanced high power frequency doubler. The light is used to create an artificial laser guide star by exciting sodium atoms in the Earth’s atmosphere at 90 km altitude. The ESO team is composed of (in alphabetical order): Domenico Bonaccini Calia, Wolfgang Hackenberg, Ronald Holzloehner, Steffan Lewis and Luke Taylor.